Y’all know I have a compost tumbler and I’m a big advocate for making your own compost. It’s healthy for your plants, cheap to make & a great way to make good use of kitchen scraps and paper trash that would otherwise just be wasted. And it’s super easy too, you just make sure to have a proper mix of browns & greens. Add a little water, do a little compost turning and BOOM! Black gold for your garden. You can see my Compost Post Here. For ‘greens’ you can use grass clippings, vegetable peels, etc. And for ‘browns’ you can use dried leaves, paper, twigs, etc. I often use corrugated cardboard boxes to fill my ‘browns’ requirement. But ugh, tearing all that cardboard requires some elbow grease #amiright? 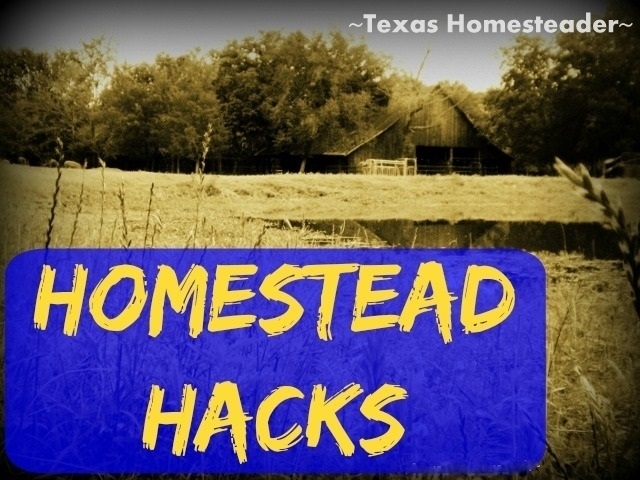 Come check out this Homestead Hack to see how I make it easy. 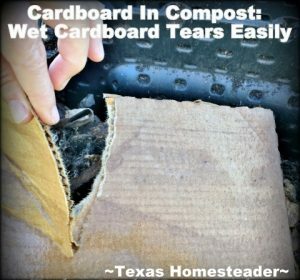 Now I realize there are purists who refuse to use corrugated cardboard in their compost stating they don’t like the glue residue that’s present when combining the cardboard layers. But y’all know there are precious few areas where I’d classify myself as a purist. LOL! But if you’d prefer, use brown leaves instead. Me? I’m a big fan of ‘use whatcha got’ and my community volunteer work is ripe ground for picking up free cardboard from used boxes. I used to bring that cardboard home, take it to my composter & just start ripping. At first I’d rip them into reasonable-sized chunks but as my hands got tired I’d become more & more tolerant of larger chunks too! HA!! Then I decided there must be a better way. Enter my rainwater collection area. You see, I have a large overflow tub next to my 55-gallon rain barrel. When the rain barrel is full, the overage rainwater is diverted into this large tub. I typically dip water from this tub with my watering can for quick & easy watering. But today it’s going to simplify my cardboard tearing! I bring home about a dozen box flats and drop them into the water. I give ’em a little push to submerge them and then walk away tending chores for a few minutes. When I return the cardboard is soaked in water and has lost its rigidity. l take all those wet cardboard flats to my tumbling composter and effortlessly tear it into small chunks. This not only gives me a hearty supply of browns for my compost, but adds a little water to the mix as well. A 2-fer-1 of sorts! I give the composter a quick tumble and I’m done! I love my *tumbling composter, it simplifies the compost-turning process, makes compost faster & helps keep critters out too! It was such a great purchase when we moved out here! RancherMan always says “Work Smarter, Not Harder” and this certainly fits the bill! Want To Read Other Gardening Hacks? This entry was posted in Blog Posts and tagged Environment, Gardening, Homestead Hacks, Make-It-Yourself on March 29, 2018 by Texas Homesteader. I have ben a composter since childhood when my favorite grandmother always had a pile of yard debris behind the brick outdoor fireplace. Over they years I have put everything from soup to nuts in my compost bins which, even though I think I would love a tumbler, are big plastic (of some ilk) things. They have a not very handy (read mostly useless) little pieces that are supposed to slide up allowing you to get finished stuff from the bottom. The birdman who lives with me forks it into the back of the pickup to drive it from up by the house down the long driveway to the garden area. Gotta love a man who can wield a pitchfork. Sooo I have read (probably in Mother earth news) about various things that are compostable including meat (never any left overs of that with the birdman) and bread (same same with bread here) but all the kitchen compost and garden trimmings etc go into either the one here by the house or down to the ones in the garden. I have started putting the bones from making bone broth into mine. After boiling all day I break the bones up with the kitchen only pliers and boil some more. I figure how much different can that be than adding bone meal to the dirt. Cardboard always goes to suppress weeds. as do lots of newspaper that doesn’t get used to start a fire in the stove in the winter chill. Here in the NW we have a lifelong battle with weeds if we want to garden. So I have no idea if I’m good with the browns to greens ratio but we seem to grow a garden from which I’m still eating Kale right off the stalk. We work with what we have, don’t we? Feed sacks, cardboard, hair, bones. It all makes life good. What brand tumbler do you have? The link took me to Amazon and there were many types listed. 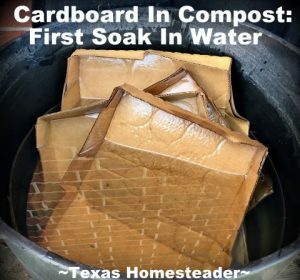 Great idea to soak cardboard first – it would not have occurred to me. Thanks! Great idea! Real quick, can you compost black walnuts? I have a tree on our land, and there are a lot of old nuts on the ground beneath it. I was wondering if I could just rake all that up and plop it into my compost pile. I figured if anyone can tell me it would be you. Now that you mention it, I recall reading about that. Hmmmm….well, I guess I’m tossing them all in the burning barrel and lighting it off. Thanks!